“A photograph by Henri Cartier-Bresson, Place de l’Europe, Paris, 1932 encapsulates a key aspect of his peculiar talent perhaps more than any other single image from his illustrious career. 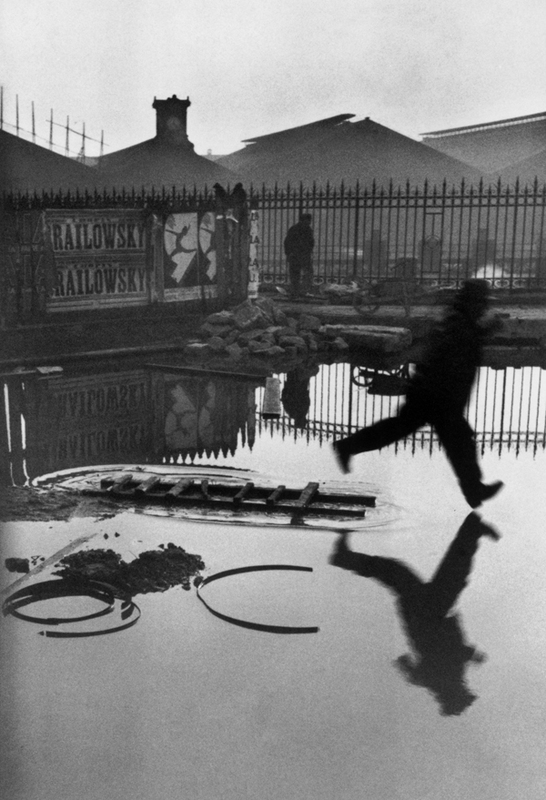 On a grey day, in a flooded urban space enclosed by a high, spiked metal fence, a bowler-hatted man leaps from the end of a ladder lying in a pool of shallow water and is caught by Cartier-Bresson’s shutter a split second before the man’s descending heel breaks the smooth surface of the water. No supplementary information is given, other than the title. Can we induce, with a satisfactory level of certainty, what has happened in the moments before the one depicted? Do we know what will happen next? On engaging with the photograph, there’s a tension quickly established between the sliver of time crystallized by the depiction and the extension of time that we know must have surrounded that sliver, before and after, in the reality from which it has been abstracted. We continue to look at the photograph not just because the extended time is both implied and missing: we know, or feel, that there’s planning and consequence, action and reaction, cause and effect, anticipation and result all caught up somewhere here too, but we can’t exactly see any of those, either. The photograph presents us with these puzzles while simultaneously making clear that it can offer no solution, and no further information. We feel as though it’s going to continue to unfold, but we also know that it’s all over. No matter how visually explicit, its story content is moot. […] Most of the time […] we make confident determinations about the incident without being aware that they’re conjectural. By the shortest common-sense route, we work on a number of cues that invite us to make a provisional settlement of the narrative issue framed by the picture. What leaps out for me in this paragraph is Kozloff’s use of the terms ‘story’ and ‘narrative.’ He’s actually talking about a Cartier-Bresson photograph too, though a different one; one even less resolved as to its antecedents and its future. Nevertheless, the topic of narrative is confidently—presumptively, even—dropped on the table. Perhaps we’re not surprised at this, because it’s by no means the first or only time that narrative properties have been attributed to still photographs. But really, we should be surprised. We all probably have some intuitive idea about how narrative works in the most common and typical places we find it: verbal stories, whether written or delivered orally, and whether mediated or not. With a little thought, though, it seems clear that in the narrative media that contain both verbal and visual information—plays, films, TV programmes and so on—the visually performative or pictorial components are not merely subservient illustration, but are bound up with, and do much of the work of, constructing and conveying the narrative that is the complete work. We could take away the pictures and still have a mostly intelligible narrative (think, for example, of the soundtrack of a TV comedy); with a slightly greater level of difficulty, and some approximation and guesswork, we could remove the soundtrack from a TV show and still have a serviceable narrative of sorts. But what if neither soundtrack nor movement is present? Is it possible that still photographs, at least some of them, alone and unassisted by descriptions or captions, might meet essentially the same requirements for narrative as those which so qualify a passage of text? Photography, narrative, time: Imaging our forensic imagination is the latest addition to Intellect’s Critical Photography Series. By paying particular focus to the story-telling of a single photograph rather than the sequence, Battye explores how photography is frequently used to make fictional narratives. In analyzing photographs, Battye applies contemporary research and theories drawn from cognitive science and psychology and argues if it were not for psychological attributes of people, the essential photographical themes of narrative and time would be irrelevant. Tags: Greg Battye, photography. Bookmark the permalink.